This promotional Youth Vigor Elastic Waist Pant offers superior abrasion resistance and high mechanical stretch for a comfortable fit. Stylish and functional at the same time, Holloway youth Vigor elastic waist pant is made from Flex-Sof material for a smooth, lightweight, knit surface with abrasion resistance. 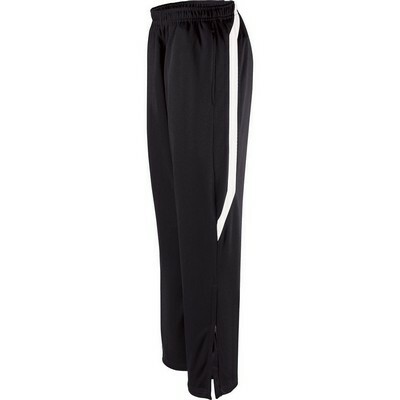 This workout pants features higher mechanical stretch offers better range of motion while moisture wicking technology ensures dryness in all weather conditions. Pinhole micromesh blocking along the heat zones facilitate breathability. The pant also features easy entry side pockets and elasticized drawstring waist for optimum comfort and fit. Straight leg has open bottom with zipper hem for a stylish look. Available in two tone design, this pant is a great choice to promote your brand at sports shows or events. Place bulk order and customize the pant with your company logo and personalized message.